We're putting together a 'best of' for each of Chinatown's wonderful (and under-appreciated) food courts, starting with our first love, Eating World. Like a mother with a secret favourite child, we love all of Chinatown's foodcourts equally, but if we had to pick a favourite it would be Eating World. It's partly for nostalgia, we've both been eating here since the early 1990's, partly for the fantastic name, partly because it has the most upbeat and busy vibe, and mostly because every stall here is excellent, each in it's own way. We've picked some of our favourite dishes in this post. We'll update the list as places change and new favourites arise. Ramen at Gumshara - Gumshara's ramen (Japanese noodle soup) has a cult following and is possibly the most popular dish in all of Eating World. Some folks say the broth is too rich, thick and heavy for them to finish, but we see armies of tiny Asian girls knocking back bowls of this stuff and going back for seconds. So man-up (or lady-up) and get into it. Around $10-15. - Update: Shawn couldn't finish his pork rib ramen today, he is a big girl's blouse, man this stuff is rich and heavy! Whole Fish from At Thai - We've noticed a lot of Thai folks eating here, a good sign. The whole Fish in Thai Salad Sauce ($10.50) is a huge hit. Beautifully presented, very tasty, the best whole fish in the food court in our bloated opinions. Twice Cooked Pork from Gourmet Sizzling Plate - Georgous, almost western roast pork flavours stir fried with veggies, eye-wateringly delicious. We would have happily paid $25-$30 for this dish at the likes of Golden Century, here it's only $10.80 with rice and a side soup. Sang Choy Bow at Hong Kong King's Chef - It ain't fancy but it's cheap and tasty. The finely grated cabbage under the pork adds an extra dimension of freshness, texture and yum. $5.50 for two. Chinese Veggies at Hong Kong King's Chef - Highly recommended as a fresh complement to any meal or also excellent on it's own with a bowl of rice. $4. Chinese Pancake from Red Charcoal BBQ - Made on fresh on a hotplate in front of your eyes: a large flat pancake with an egg and hoisin sauce on top, plus a chinese breadstick, ham, and fresh coriander, rolled up and ready to cure the meanest of hangovers. It's not art but dang it's delicious, a perfect hunger buster or hangover feed. $6. Grilled Stuff on Sticks from Red Charcoal BBQ - In Asia, just put your food on a stick and it's party time. Grilled skewars of lamb, meat, chook, prawns, the works. Very popular. Whole Fish from Soy King - A whole fish for around $10, it's incredible. This is hugely popular with Chinese taxi drivers, enough said. Available fried or steamed in a few different flavours. This breed of fish that we call 'food court fish' is best fried or with a strong sauce at it has a strong, muddy flavour. $6 Vietnamese Roll with Ice Coffee from Phuong Special Vietnamese - It's easy to overlook the little Vietnamese roll joint in the corner. A roll with a super sweet, cold Southeast Asian style ice coffee for only $6 is an absolute bargain. Or just get the ice coffee on it's own for $2. Nasi Campur from Pondok Selera - Three choices on rice from the bainmarie of love for about $8, great Indonesian food. Includes the classics such as beef rendang and chicken curry. Some folks may be put off by the bainmarie but that's the way this type of food is served in Indonesia. Pick three dishes and the lovely folks will also pour a scoup of curry sauce over the top for extra flavour. We recommended balancing your meat and veggie dishes so it's not too heavy in the tum. Deep fried cumin lamb chop from Sydney Foodie Station - crunchy fried lamb ribs (not really chops) coated with plenty of cumin, the cumin coated onions are nice and sweet and the roasted chilis pack a fair wallop. Eat them whole to get the full flavour on your taste buddies, you may need to spit out some bones. $9.80. Spicy tea mushroom with veggies - $12.80. A big serve of veggies with a nice chili hit, this is one of Mr Shawn's all time favourite dishes in Chinatown. $12.80. 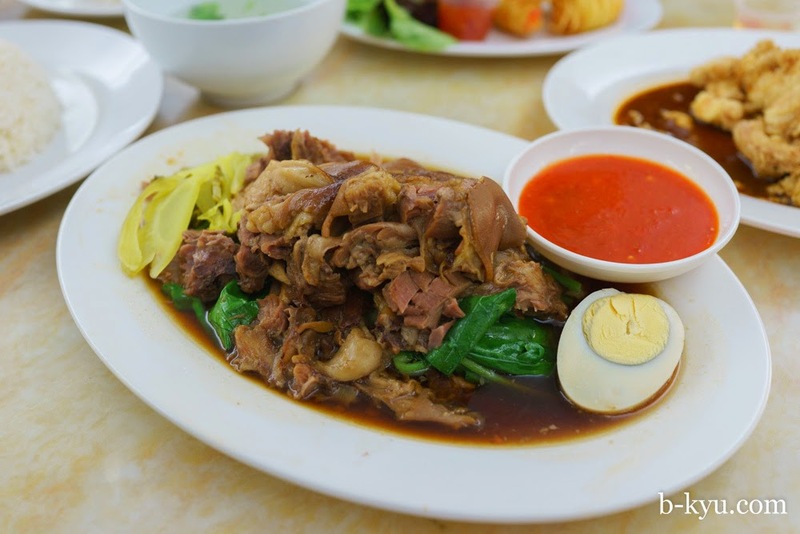 Stewed pork leg on rice from Tiger Cave - $10.90. A big serve of lusciously lardy and sweet Thai stewed pork on rice, it's also excellent in soup. 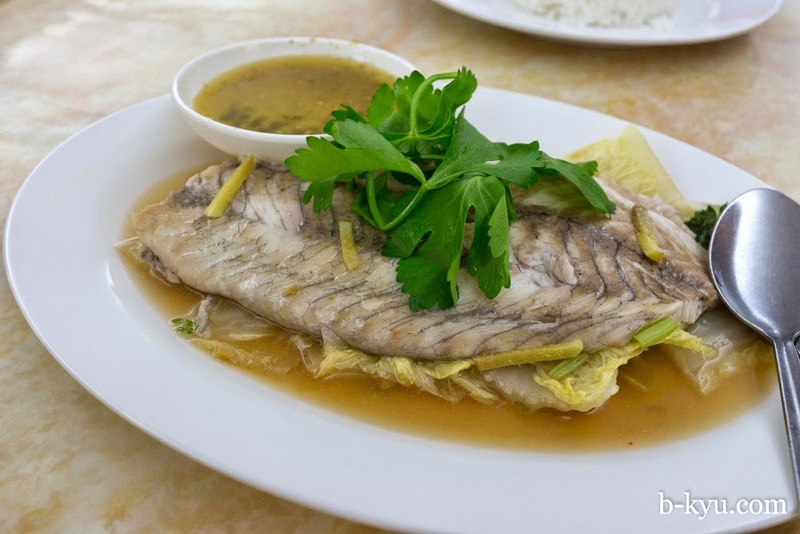 The steamed barramundi ($10.90) from Tiger Cave was a surprise favourite, kinda healthy too. Shawn drops in for this when he feels like something light yet super tasty. Thank you for this excellent list! Agree with both of you on all your choices here! Wow - you've seen it all! I have yet to step foot inside here, but at least I'll know what to order from each store! Wow, this list is great. Got all my favourite dishes on it. Love Gumshara and Singapore Shiok. I was SOOOOOOOOOOOOOO craving har mee on Saturday and went to Eating World based on your blog and a couple of others and.. they didn't have it! And apparently they won't for another 2-3 months! WTFFFFF! Oh no catty! This can't be true! We'll have to seek out an alternative and report back. I came across this just after discovering Eating World when I arrived in Sydney in mid-January. I have to let you know that the fish balls are no longer available. It made me sad. They looked fukin good.